Drop Python Script: and use a simple terminal program. If you can not easy type it on keyboard, do not send over serial. Get fancy later, now is time to keep is simple. You are wanting to read and write BYTES of data to a memory chip. This is not a character! Intel Hex was created for a reason, part is the working around serial port problems. How can the Arduino check for data errors? What you are writing is getting messed up with what you are reading. You really need this later and should do it now to help find the problems. That I hadn't thought of. I guess my thinking is that current_character is reset when I call for the next byte from the serial buffer. Is that not how this works? but then when you use it in Read() it will still contain that value it read from the pi which was 0xff. So you are effectively adding 0xFF to whatever you read from the data bus. The address is at the memory chip's address pins. Do every thing else needed by memory chip. Should take care of Arduino data buss direction and change it if needed. Test and actual program will use these three functions. This is kind of what I attempted to do with the current code, the functions definitely need revising, but I feel like they are getting there. I may have made a bit of a break through, I'm not sure. If I have got the declaration of local variables correct as rich suggested, and they are cleared each time a function ends, then I may be getting closer to finding the problem. I modified the code to cut out all the Serial garbage, as well as changed the variables to type byte. 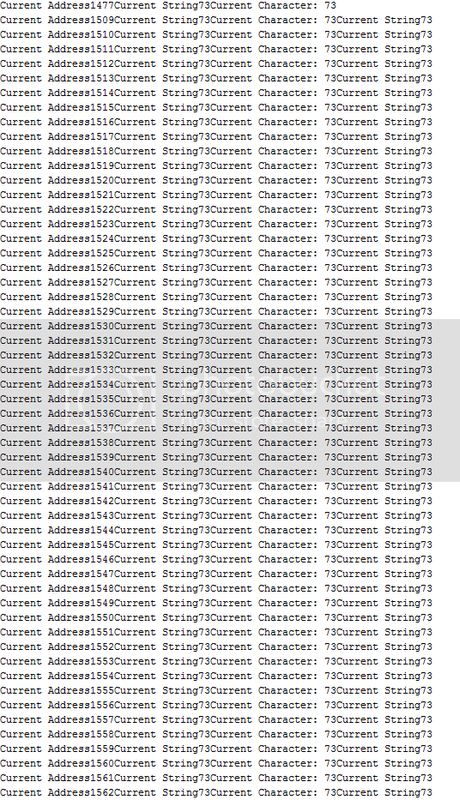 For testing purposes I have set the byte current_character to a constant value of 01000110 (which is 'F' in ASCII). I've also essentially tried to force the code into the writing part of the program. Thus the program should read what's in the current address, write to the address and then read it again to see if it's changed (as C suggested previously). If my declaration and understanding of local variables is correct, then the system is writing and reading this value correctly. For Some Reason it's off by two always. And it's reading a value of 72 on the first read cycle on every address value but 0. This makes me think that the I still don't get the idea of local declaration of variables. Tomorrow I am going to strip it right back to the bare minimum. I will put LED's on the data and address BUS and write some code that literally forces one input at one address. I'll then see it I get the right value back. Nothing fancy. Hopefully I shall come back with some good news. Exploring the World, One mistake at a time! The local variables you have allocated inside of Read() need initialising before using them otherwise they contain whatever garbage is on the stack when the function is entered. I should've highlighted this subtle difference between local and global variables in C although my example code did set it to zero before using it! I would suggest you always initialise every variable (local and global) where you declare them. This forces you to think about what the initial value should be, helps anyone else reading your code and avoids getting caught out by the language/compiler. So onto your Read() function: You only need one local variable in Read() not two. Get rid of current_string and use the previous code I posted for your loop, but make sure you initialise the variable to zero before trying to add number to it for the first time. Just had another look at your code. You said you were setting 'F' as the character to write. But declared current_character as follows. Now, Binary 01000111 corresponds to ASCII 'G'. Unfortunately for your program the C compiler will interpret 01000111 in Octal which happens to be ASCII 'I'. Maybe that is a source of some of the confusion. Now fix your functions, and save some time. Shorten up your prints so actual information is easer to read. A binary output is better choice here I think. With the functions being passed the data or returning the data, arrays are easy to use. Is this program a one shot thing? Parts of it could be used many places. With functions a bidirectional data buss. More Arduino pins could be like this. The above two parts can be used many places. Not far from hardware for Z80 DMA or Z80 reset boot loader. With a little work "Data_BUS" above could have the software using this array adjust for different number of pins in array. Could have two arrays "Setup_Input_Pins" & "Setup_Output_Pins" for the setup function to use with pinMode. I think it is worth the time to get the software right and at same time simple and readable. Understanding how it works is a big plus. This will save time now and in the future. So keep software simple and get software working correctly. When software is working, only then slowly make changes and test the changes to see if software still works. // Beginning Serial Communication with PC, used for outputting what the system is doing. Time to put this code into it's own function and then test out the data BUS. Something really important has just occurred to me though. In the old code I never reset the value of current_address to 0. So when I went for a read function after writing to the system, it would be completely the wrong address. This still doesn't solve the problem, as I did a read cycle during the writing function, but it's still super important. Need to sort that out in this code. I've now also confirmed that the code used to write the data onto the data BUS is working. Here's the code: (Bare in mind that the Increment_Address Function is essentially commented out). I'm now going to hook up the first eight bits of the address BUS to the Data Bus and see if the system is reading the data correctly and giving the right value. That is three simple functions where you are doing a cut & paste. The other functions have been listed, A blank function with proper name and again a cut & paste to move code. Step two read what you have pasted. If information from function goes out of function for other code to use, it is not a void function, but a function with a type and you need to make internal to function data be returned properly. In most cases I have spent more time typing here then you would need to make the change! I don't understand what you mean by having a function for the address BUS and the data BUS. For the control BUS is it wise to have a function because it needs to be set to different values depending on whether you are reading or writing? I'm following what you said here ^^^^^^, seems to make more sense as a setup to me. But then I'm not as experienced at this. I've verified the read function by connecting up the data BUS to the address BUS, it's reading the correct value in, so all seems good. I'm going to put this stuff into it's own function and then set then put in the code for the memory control pins. Time to see if I can actually write something into memory and then read it out again. others are more of the same idea with some returning data from function. You have been using functions that have been written by others. You need to write a lot of very simple functions. Simple makes it easer to read and reduces area for problems. right now you are dealing with a hardware interface. Three separate interfaces that need to work together to do what is needed. The simple functions are called from higher level functions to do the job. Time to see if I can actually write something into memory and then read it out again. This is one place where you are going wrong. Get the low level functions working properly. Then when adding the to/from memory part, you are actually doing more testing of low level functions. If the low level functions are correct then the errors must be in function calling lower level functions. Well, they say 3rd times the charm, and I think it might be in this case. I think it's working! That awesome feeling of success! Can't thank you enough for your help guys! I just need to modify the control pins for the EPROM's, and then I'm good too go I think. After I have typed the whole of the ROM file into the ROM_Array that is. You need to move beyound treating functions as just a grouping of statements and exploit the fact they can be passed data and return data. One of the issues you have created for yourself by not passing data to/from your functions is that you are forced to mix your global application state mutations (e.g. incrementing address and reading serial ports) inside of what should be primitive functions that somebody else could easily use as a bias for their application without unexpected side-effects. Go back and read the thread again with your newfound skills - the type of functions have already been suggested multiple times. Ok, that makes more sense. Apologies to C who has said it multiple times, it's just taken me a bit of time to understand what your trying to tell me. I'm full of mistakes! The system is still working as far as I can tell, but I forgot that I had moved some of the jumper leads from the data BUS to the data pins on the memory. When I was looking at the data that was coming back from the system before I remedied my mistake, I was seeing rare occurrences where the data would be wrong, but it would be write for the same value one cycle later. Having moved the jumper leads back to the correct place the system is working very reliably. My question is, how was the data coming through when I had the jumper leads one row off on every data line. What I've learnt in physics tells me it's either something to do with the magnetic fields induced in around the tracks, although they would be very small. Or some kind of capacitance? This may work, but you are not seeing the big picture. You typing or translating that rom image in Intel Hex format is going to allow more errors. Is a big waist of time also and would have to be done again for a new rom image. If you treat the Arduino as a dumb device, just three simple commands are needed for a program on the PC to read the Intel Hex rom image and talk to the Arduino and program the chip. Not great way to do this but can be faster then you adding errors with translation. 1. Tell the Arduino the address. 2. Tell the Arduino what byte value to write. 3. Ask the Arduino what is the byte value. You are making it harder on you self getting the job done. You have made progress in programming but not seeing big picture again. There are many reasons to use the Intel Hex format directly on the Arduino. You can get the above and then add this step with out much loss of time. Do it right and things grow real easy. In how many other programs on Arduino could you have a use for a few Arduino pins giving you more output by using a 595? And just by adding an additional 595 on hardware side get 8 more bits of output? Using good functions here, passing data to and from the functions will let this become an easy copy and paste. It also helps this program! Your program gets simple and easy to read. It also allows easy additions. Most programming tools for the Z80 create Intel Hex format files. Easy way to use of these files makes your life easer. If You hold the Z80 with the /RESET line low, think you will find that the Z80 Address, Data & Control lines are in the tri-state mode. The 595's have a tri-state output. What you are using on Arduino for data & control buss can be set as inputs. To Z80 this is same as tri-state. The Arduino using a pin connected the Z80 /RESET pin could make the /RESET pin go low. The Z80 then tri-states as above. The Arduino could then enable it's outputs and program Z80 memory. 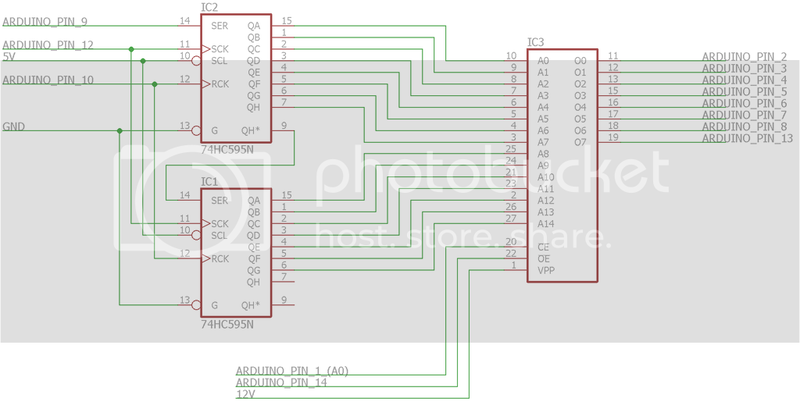 When done the Arduino makes all outputs tri-state or inputs and releases the Z80 /reset pin. You have just started the Z80 with a new program that can easily be changed. A great way to learn the Z80 with out having to program and erase proms. The kicker is that this can also read Z80 memory. A small addition and Arduino can read & write Z80 memory while the Z80 is running a program!! Many people giving you hints. Think of the iceburg, most is under water while the hints point to what you can see. bad programming or the ram chip not caring. A scrambled address buss in to ram works fine. A scrambled data buss in to ram works fine. Hmm ok, however long it's taken me, I am cottoning on to the point you are making. It took me a while, but I understand what you mean about looking at the bigger picture. Less hardware specific functions can be used in all sorts of code, as you say if I ever need a 595, I can use code that I have previously written. This makes a world of sense. Also I never really thought about the Arduino being an active part of the system in terms of programming memory, acting as a sort of boot loader. What's great about this is that the Arduino can also be used to access more modern devices on the I2C and SPI BUS, as you were explaining to me in my other post. I'm starting to see what's below the surface, just takes a while to understand the basics of your surroundings. This computer build has been a great learning process so far and will continue to be, a few months ago I didn't understand anything about the internal workings of processors, memory, etc. Now I understand how the basic system works, and what it's actually doing. It definitely gives me a new found respect for what's happening inside my computers processor as I type this. The hardware will work properly when you have a good program and proper connections. The Important thing now is to re-read this thread and fix proper functions. When you have this, the remaining parts can be done fast and easy. Remove the serial prints from your last code post and put them in separate functions. Ok, so I tried to program one of my OTPROM's before I modify the code more. I've got something working so I am inclined to get one programmed ROM so that I can test the rest of the build. I will being going back and making the changes you have suggested however. Now I don't know whether its an issue with the read cycle of the system, or something worse. But the data I am getting back is extremely weird. There are repeating patterns, nothing like what the code is supposed to look like. I fed 12 volts into the VPP pin as the datasheet suggested, and made sure the control pins were correct for the OTPROM chips and not the SRAM. So I don't know what's wrong. I added a capacitor from VPP to ground as the datasheet also suggested. Thanks for all the help, hopefully there is a solution to this as well, I just can't wait to see my computer going for the first time!